In 1795, Napoleon Bonaparte had a problem: his army was hungry. In the days before the invention of freezer trucks or MREs, keeping an effective fighting force supplied with enough food was a logistical nightmare. At the time, invading armies usually lived off the local countryside, but this was notoriously unreliable: for one thing, peasants often destroyed their own crops to resist the invaders. Napoleon needed a way to store and transport rations for months on end, to fuel his troops through long months on campaign. An inventor named Nicolas Appert claimed a substantial reward from the French army for discovering the answer: cans. With canned food, the army could take meat, vegetables, and even milk along for long campaigns – and one of the first staples to receive this treatment was sardines. Vitamins wouldn’t even be discovered for another hundred years, but if Napoleon had known how well he was feeding his men, he would have been very pleased with his choice. Sardines are packed with nutrients of every kind, and the canned fish are actually even better than the fresh, because with canned sardines, you’re eating the whole animal. Not everyone can get hold of organs, bones, and skin from their local grocery store, but almost anyone can find sardines: they’re so popular that they’re even available at some drug stores and gas stations. These little fish are so small and cooked so thoroughly that even the bones are soft enough to eat, providing a concentrated source of vitamins, minerals, and healthy fats in one tasty package. One can (3.75 ounces, or 92 grams) of sardines will net you over 100% of your daily B12, 63% of your Vitamin D, 24% of your B3, and 12% of your B2, as well as slightly smaller amounts of every other vitamin except for C. And that’s less than 200 calories, so if you’re eating sardines on top of your salad at lunch, you’d need at least 2 of those cans to make a proper meal. The Vitamin D content is especially notable, because so few foods contain it. Most of us get plenty of Vitamin D from sunlight – or at least we did, until we started spending all day inside. Our modern indoor lifestyles put us at a greatly increased risk for Vitamin D deficiency, so it’s smart to take a cue from people who have already figured out how to get enough D without the sun. In northern countries where sunlight is scarce and winter can bring 24-hour darkness, residents know the value of oily fish like sardines, and eat them frequently to stave off deficiency. Sun-deprived office workers of every climate would do well to take a hint from the Swedes and the Finns, and add some sardines to their weekly menu rotation. Most famously in Paleo circles, bone-in sardines are an excellent source of calcium. A 3.75-ounce can provides 35% of the RDA, probably higher than any other Paleo food (although we still don’t have a precise number for bone broth, so it’s possible the broth could have more). It’s true that calcium isn’t the end of the story for healthy bones and teeth, but that doesn’t mean it’s not important at all; if you don’t react well to dairy, sardines are your bones’ best friend. Not too shabby for such a small amount of food! Again, for a meal you’d at least double that, so the amounts would be even higher. Like other seafood, sardines have an excellent fatty acid profile. The fat content of a can will depend on what the sardines are packed in (olive oil will add more monounsaturated fat, for example, while an unhealthy oil like canola will add more PUFA), but just for the fish themselves, the ratio of Omega-3 to Omega-6 PUFA is 12:1, an excellent way to balance out the unhealthy Omega-6 levels in the modern diet. 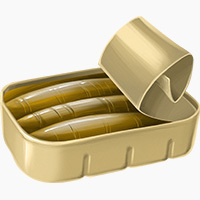 That makes sardines something like a fish oil supplement, if fish oil supplements also delivered protein, vitamins, minerals, and an easily portable snack food. Unlike supplements, canned sardines don’t need to be refrigerated, and you don’t have to worry about whether they’ve been sitting around going rancid on the grocery-store shelf. So between the supplement and the fish, the fish are the clear winners. Other benefits of sardines include their low ecological and environmental impact. Sardines are close to the bottom of the ocean food chain, which makes them much less likely to be contaminated with mercury or other pollutants. Since these toxins concentrate towards the top of the chain, they’re much less likely to be present in small fish like sardines than in large fish like tuna. Sardines are also a good choice for anyone concerned about overfishing and environmental sustainability. Pacific sardines have even earned a spot on the Monterey Bay Aquarium’s “Super Green List,” a guide to fish choices that are environmentally friendly, low in toxins, and high in Omega-3s. Choosing canned sardines is fairly simple. They’re usually sold with other canned fish (tuna, salmon, and anchovies), packed in a variety of liquids from oil to tomato sauce to lemon juice. As always, check the package and make sure all the ingredients are healthy. Olive oil is a good choice; so is tomato sauce (as long as all the ingredients are fine) or plain water. Stay away from soy oil, canola oil, or tomato sauce with a bunch of sugar in it. 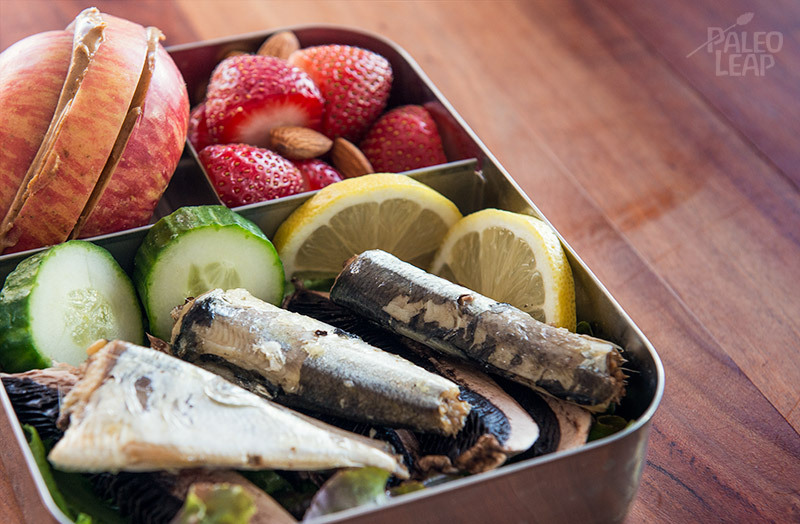 Sardines can be eaten straight from the can as an easily portable snack. They’re also popular as a salad topping, or smeared with a little homemade mayonnaise, mustard, or hot sauce. Or use the sardines themselves as the sauce with some sardine and roasted garlic spread. For a different twist, add them to a tomato-based sauce over meat or spaghetti squash “pasta:” they give the dish a subtle tang and an interesting flavor profile as well as adding nutrients. Fresh sardines are not as common as canned, and you’ll need to prepare the fish before digging in. This can take a little effort if you’re not used to it, but the seafood counters at many grocery stores will actually do it for you right in the store; just ask. Removing the large bones is standard, but you can still get some of the calcium by leaving the little bones in: they’ll get so soft and tender during cooking that they aren’t even noticeable. The next time you’re passing through the canned fish aisle, look a shelf above the cans of salmon, and consider the sardines as well. They’re convenient as a quick snack to throw into your purse or car, and for roughly the same amount of calories as a Larabar or another energy bar, they provide a lot more nutrition. You don’t have to be part of Napoleon’s army to appreciate such an affordable and convenient source of energy and nutrition!